Grandma’s Genes held Ottawa’s first (World’s First) genetic genealogy Swab-A-Thon. The event, held at Bowman’s Bar and Grill on Saturday August 27th, brought a diverse crowd. People came with questions about their origins, asking what they could learn from DNA testing? Genetic genealogist, and Grandma’s Genes co-founder, Marc Snelling opened the event. He spoke about the discoveries that can be made through DNA. Marc spoke about how to learn more about your ethnic background. About how and where we fit into the human family tree. He also spoke about breaking a brick-wall in records, such as adoptions where no records are available, or finding unknown grandparent. Other reasons for DNA testing he covered included; leaving a legacy for your children and grandchildren, making new discoveries, and connecting with living cousins. Grandma’s Genes co-founder Mags Gaulden spoke about DNA tests currently available to consumers. Autosomal tests (chromosomes 1-22, and X), are a test offered by ‘the Big 3’ testing companies, 23andMe, AncestryDNA and Family Tree DNA. 23andMe includes testing for DNA health markers, and idetifies paternal and maternal haplogroups, currently priced at $249 (CA). She also spoke about mitochondrial DNA (mtDNA) a test of your direct maternal line and it’s associated halpogroup, and Y-DNA a test of the direct paternal lines. (tests offered by Family Tree DNA). She also spoke about The Genographic Project, a science-focused DNA project to document the human family tree and it’s haplogroups. Grandma’s Genes co-founders Mags Gaulden and Marc Snelling answer attendees DNA questions at the Swab-A-Thon. Preparing genealogical reports for First Nations or American Indian Nations, and other lineage societies such as United Empire Loyalists, Daughters / Sons of the American Revolution. Lesley Anderson from Ancestry.ca spoke to the crowd about the Ancestry database, over 2 million samples. The size of the DNA database together with millions of user-created family trees creates discoveries through Ancestry DNA Circles. Ancestry DNA Circles are an automated tool that discovers common ancestors shared between DNA matches. Everyone who came had a different reason for being there. One adoptee sought to learn more about his birth parents. Two others wanted to learn more about what their DNA will tell them about their deep roots in their home countries, France and Algeria. Another wanted to know more about his maternal granparent. An ancestor the family says was in England while other lines were in Eastern Europe. Several others purchased tests as gifts for their relatives. Free kits won by three! Three free DNA kits were awarded. One from Grandma’s Genes., one by Family Tree DNA, and a third from Ancestry.ca. Geraldine won the FTDNA Family Finder kit offered by Grandma’s Genes. Vanessa won the Family Finder kit offered by Family Tree DNA. Lyle won the free AncestryDNA kit. Those who won prizes all purchased additional kits for testing themselves at both Family Tree DNA and AncestryDNA. They also purchased kits for other family members. Thanks to everyone who came out and helped create Ottawa’s first genetic genealogy Swab-A-Thon. Several participants were hopeful another Swab-A-Thon will be held. 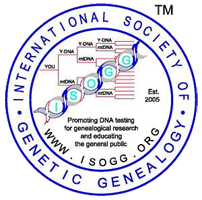 An event to bring their cousins and family members to, to learn more about DNA testing. Grandma’s Genes hopes to bring another Swab-A-Thon to the area in the future.